Why are the analog sticks on my Nintendo Switch controllers all starting to drift? About 2 weeks ago I noticed that the left analog stick on my Nintendo Switch Joy-Cons started "drifting", that is, without touching the stick (when it was centered) it would register as off-center causing characters in games to start randomly walking in various directions, frequently downward. This obviously makes playing games rather difficult, especially when precision is required. The controller software / firmware was up to date and after researching and finding this is a common issue, and my console and joy cons are 13 months old (1 month past warranty) I bit the bullet and bought new controllers. Yesterday the Pro Controller which I bought separately from the console started exhibiting the same behavior. It seems like too much of a coincidence to me that two separate controllers purchased at two separate times would start having the same problem at the same time. This makes me feel like it's a software problem, not a hardware one. It sounds like the thumbsticks are wearing out, which is a problem common to all thumbsticks and not limited to Switch controllers. It's probably just a coincidence that you have two affected controllers. I would try recalibrating again. If calibration made it worse that makes me think something went wrong in the calibration process. 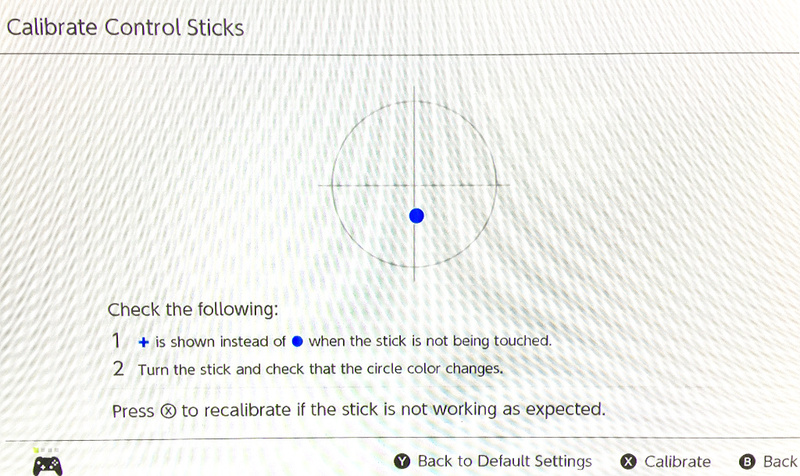 The stick is so off-center it seems like it must be a bad calibration rather than just a loose stick. Storing the controller properly will help avoid damage to the thumbsticks. I throw my Switch Pro controllers in a backpack every day and have never seen any issues like you describe, but it can't be good for them either. Make sure the stick isn't pressing up against anything when it's in a bag or case. Replacing the thumbsticks isn't TOO difficult but does take some time and a good screwdriver. The joy-con thumbstick modules are less than $10 on Amazon. Not the answer you're looking for? Browse other questions tagged technical-issues controllers nintendo-switch or ask your own question. Can I configure the analog stick on my PS3 controller as “vehicle throttle” in GTA3 on Mac? Can I change the steam controller's sticks? Are you able to use the Nintendo Switch pro controller when the console is undocked? Nintendo Switch left Joy-Con disconnects frequently. Fix?